A pioneer and leader in the preservation and restoration of native Midwest prairies since the 1930s, the University of Wisconsin–Madison Arboretum has a stellar collection of prairie plant species, including horsetails, ferns, rushes, sedges, grasses, shrubs, vines, and wildflowers. This guide illustrates and describes more than 360 native and introduced species that grow and bloom on the Arboretum prairies and also briefly discusses or mentions many additional species, infraspecific taxa, and hybrids. Its intent is to increase awareness and respect for remaining small prairie remnants, motivate readers to work for prairie preservation and restoration, and encourage the planting of native species in yards and gardens. Botanist and taxonomist Theodore S. Cochrane has written the text to engage a variety of readers: prairie enthusiasts, gardeners, amateur botanists, younger students learning about plants, and college students and professionals. Nomenclature follows in part the new APG classification system. 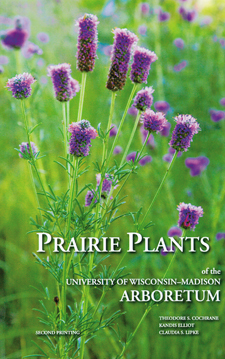 Richly illustrated with detailed color photographs by Claudia S. Lipke and botanical illustrations and maps by Kandis Elliot, the guide provides a beautiful and informative sample of the flora of the Arboretum and of the southern Wisconsin prairie landscape. Many of the plants, of course, are also found throughout the upper Midwestern United States and in adjacent southern Canada. Theodore S. Cochrane is senior academic curator of the University of WisconsinMadison Herbarium. His several books include Atlas of the Wisconsin Prairie and Savanna Flora, coauthored with Hugh Iltis. Kandis Elliot and Claudia S. Lipke are senior artists in the Department of Botany at the University of WisconsinMadison. Elliot has created thousands of illustrations for science articles and texts and has authored and contributed to more than fifty publications. Lipke has been producing scientific and fine art photographs for more than thiry years.